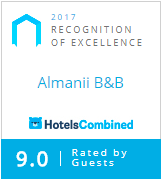 Almanii B&B is a modern establishment with the highest accommodation standards. Your comfort is of utmost importance to us and to that aim we provide fresh towels, crisp linen and have our rooms serviced each day. All rooms are tastefully decorated to create a restful space where you will feel relaxed and at ease. If you would like any special arrangements made for your room before you arrival, this can be done on request. PC Station & Printer – Useful for checking emails and printing boarding passes. Our delicious home cooked breakfasts are served between - 8am and -9.30 am. Vegetarian and special dietary needs catered for.Please inform B&B in advance if you have special dietary requirements. We use only locally sourced , fresh produce and my Mum’s free range eggs and jams(when available). Check-in - 4pm - 6pm. Guests must notify B&B of arrival time 48 hours before arrival. Check-out - no later than 11am. Guest planning to arrive outside of standard check-in hours are required to contact the property to organise check-in. Early or late check-in is available but prior notice is required. Any cancellation within 72 hours of date of arrival or no show - 100% of booking charged. Please note - Cancellation periods apply to the Arrival Date not the Arrival Time so therefore cancellations must be received 72 hours before midnight (Dublin Time) from date of arrival, to avoid any cancellation fees.